I'm a sucker for history videos... and I enjoyed the trip back in time that these were. While I was aware of the feuds that existed in UNIX-land and UNIX-GUI-land back from the early days I didn't witness it personally... so the first two expose some of that. The third video shows what moving from Windows 95 to Windows 98 was like... including the Linux alternative with an interview with Linus himself. Enjoy! I stole this from a press release. Over the past ten years, documentary film has undergone a renaissance, and the art form is more vital than ever. Hosted and curated by local award-winning documentary filmmaker Jason Burlage, The Bozeman Doc Series aims to bring the year's best films from around the world to the Emerson Center, from environmental dramas to political profiles to intimate personal films. On Thursday, January 22nd, the Bozeman Doc Series will present the most highly acclaimed documentary of the past year, Citizen Four. A real life thriller, unfolding by the minute, Citizen Four gives audiences unprecedented access to filmmaker Laura Poitras and journalist Glenn Greenwald’s encounters with Edward Snowden in Hong Kong, as he hands over classified documents providing evidence of mass indiscriminate and illegal invasions of privacy by the National Security Agency (NSA). Citizen Four places you in the room with Poitras, Greenwald, and Snowden as they attempt to manage the media storm raging outside, forced to make quick decisions that will impact their lives and all of those around them. The film not only shows you the dangers of governmental surveillance - it makes you feel them. After seeing Citizen Four, you will never think the same way about your phone, email, credit card, web browser, or profile, ever again. The New York Times calls the film "Tense & frightening... a primal political fable for the digital age." One of Time magazine's ten best movies of 2014, Citizen Four is a rare snapshot of history in the making. Doors open at 6:30 PM, and the films begins at 7:00. Tickets are available at the door or before the show at Cactus Records and Movie Lovers. Tickets are also available online at www.bozemandocseries.org, where you can buy season passes and 7 film punch cards, learn more about the series, and view trailers for upcoming films. The series will continue on Thursdays through April with one screening every two weeks. The Bozeman Doc Series. Real people. Real life. Come see the world. I just wanted to mention that a lot of the information gathering done by the NSA is also done by commercial entities like Google and other advertising and tracking networks. I'd like to see a documentary film about that too. And now the trailer. firewall-config GUIUpdate: Somehow I forgot to mention a GUI for firewalld named firewall-config. Be sure to check that out if you prefer a GUI. I have run across a few people who are perplexed by firewalld and I must admit that I was for a while until I did some reading and experimentation. What is firewalld? It is basically a replacement for the ancient iptables service on RHEL and Fedora systems. So many of us were just used to manually editing /etc/sysconfig/iptables and then coping that file from system to system as desired, that the switch to firewalld was a bit scary. I mean, who wants to learn something new, right? While the configuration, tools and output has dramatically changed... really firewalld makes things easier and more manageable. Really. One of the problems with Linux across distros is that there really hasn't been a standardized way to handle the host-based firewall. Each distro seems to have their own way of doing it... and popular packages like Shorewall have been around for years. I think firewalld tries for a happy medium somewhere between simple and complex and a standard that distros can choose to adopt. If you want don't want your changes saved just leave off --permanent. Want to manage firewalld via a config management system? There is a formula for SaltStack here and supposedly Ansible also supports firewalld. If you are brave enough to manually edit the config just be aware that you are responsible for your typos. I've only touched the tip of the iceburg for the most common stuff. Need more info? Yeah, there is a ton of documentation including a couple of man pages. Looking forward to 2015, we have very exciting news to share on the future on OpenVZ. But first, let's take a quick look into OpenVZ history. Linux Containers is an ancient technology, going back to last century. Indeed it was 1999 when our engineers started adding bits and pieces of containers technology to Linux kernel 2.2. Well, not exactly "containers", but rather "virtual environments" at that time -- as it often happens with new technologies, the terminology was different (the term "container" was coined by Sun only five years later, in 2004). Anyway, in 2000 we ported our experimental code to kernel 2.4.0test1, and in January 2002 we already had Virtuozzo 2.0 version released. From there it went on and on, with more releases, newer kernels, improved feature set (like adding live migration capability) and so on. It was 2005 when we finally realized we made a mistake of not employing the open source development model for the whole project from the very beginning. This is when OpenVZ was born as a separate entity, to complement commercial Virtuozzo (which was later renamed to Parallels Cloud Server, or PCS for short). Now it's time to admit -- over the course of years OpenVZ became just a little bit too separate, essentially becoming a fork (perhaps even a stepchild) of Parallels Cloud Server. While the kernel is the same between two of them, userspace tools (notably vzctl) differ. This results in slight incompatiblities between the configuration files, command line options etc. More to say, userspace development efforts need to be doubled. Better late than never; we are going to fix it now! We are going to merge OpenVZ and Parallels Cloud Server into a single common open source code base. The obvious benefit for OpenVZ users is, of course, more features and better tested code. There will be other much anticipated changes, rolled out in a few stages. As a first step, we will open the git repository of RHEL7-based Virtuozzo kernel early next year (2015, that is). This has become possible as we changed the internal development process to be more git-friendly (before that we relied on lists of patches a la quilt but with home grown set of scripts). We have worked on this kernel for quite some time already, initially porting our patchset to kernel 3.6, then rebasing it to RHEL7 beta, then final RHEL7. While it is still in development, we will publish it so anyone can follow the development process. Our kernel development mailing list will also be made public. The big advantage of this change for those who want to participate in the development process is that you'll see our proposed changes discussed on this mailing list before the maintainer adds them to the repository, not just months later when the the code is published and we'll consider any patch sent to the mailing list. This should allow the community to become full participants in development rather than mere bystanders as they were previously. Bug tracking systems have also diverged over time. Internally, we use JIRA (this is where all those PCLIN-xxxx and PSBM-xxxx codes come from), while OpenVZ relies on Bugzilla. For the new unified product, we are going to open up JIRA which we find to me more usable than Bugzilla. Similar to what Red Hat and other major Linux vendors do, we will limit access to security-sensitive issues in order to not compromise our user base. Please stay tuned for more news (including more formal press release from Parallels). Feel free to ask any questions as we don't even have a FAQ yet. Since Russia has 10 days of holidays in January, I really don't expect anything to be released until late January or more likely in February. One major change in the upcoming RHEL7-based Virtuozzo Core release is the move from the internal chkpoint code to CRIU. Although there are a lot more details and specifics to come, overall I see this as a very possitive move. Video: Yes, I'm Linux. Are You? This was released by the Linux Foundation yesterday and I thought I'd share. Enjoy! 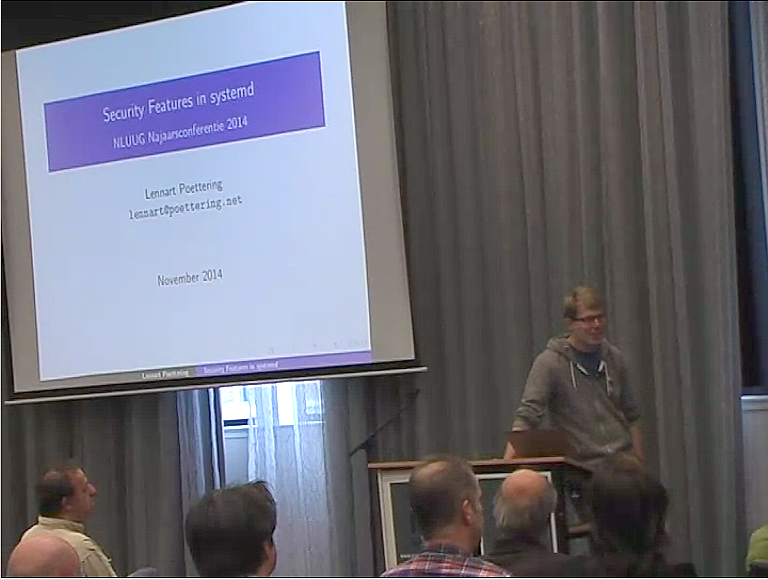 Lennart Poettering gave a presentation for NLUUG on Nov. 20th, 2014 entitled, "Security Features in systemd". I think veteran system admins would be interested in this stuff. :) Enjoy! Jordan Hubbard... should need no introduction but if you don't know who he is, look him up... anyway, Mr. Hubbard spoke recently at the MeetBSD 2014 conference giving a presentation entitled, "FreeBSD: The next 10 years". One thing I want to point out is his section on the init system. Here's a direct link to that section that I couldn't figure out to get to with the embedded video. Anyway, in the embedded video feel free to move the play head to about 27 minutes and 32 seconds into it manually if you don't want to watch the whole thing. I would give examples but I just want to forget about them. Don't feed the trolls. Here is a video I've been waiting for by Jike Song from Intel. The KVM Forum 2014 was held in conjunction with the recent LinuxCon Europe and someone (from the Linux Foundation or the KVM Forum) has been processing and posting presentation videos to YouTube in a staggered fashion. About 13 hours ago this video appeared. When I noticed the topic on the KVM Forum schedule (along with the slide deck [PDF]) a week or two before the event, I was really looking forward to learning more. The current implementation, so far as basic features go, seems to be fairly complete but it is currently targeted specifically at the Intel Haswell architecture using the i915 video driver. The presenter says that the approach taken should be adaptable to other GPU architectures beyond Intel. Their initial goal is to get the code released (it is under a dual GPL/MIT license) and to work with the KVM development community to get it upstreamed and part of KVM proper... and to work on more advanced feature implementation. As it stands now the basic features are present: hardware assisted GPU functionality for VMs in a shared fashion that offers 80-90% of native speed. Near the end of the presentation is a demo video that shows two Linux KVM VMs each running GPU intensive software (one game, one benchmark). As I understand it, when a GPU-driven application is displayed it is full-screen and there isn't currently a windowed mode to show more than one VM at a time. I do wonder how well 3D accelerated graphics would display over a remoting protocol like SPICE? Enjoy!